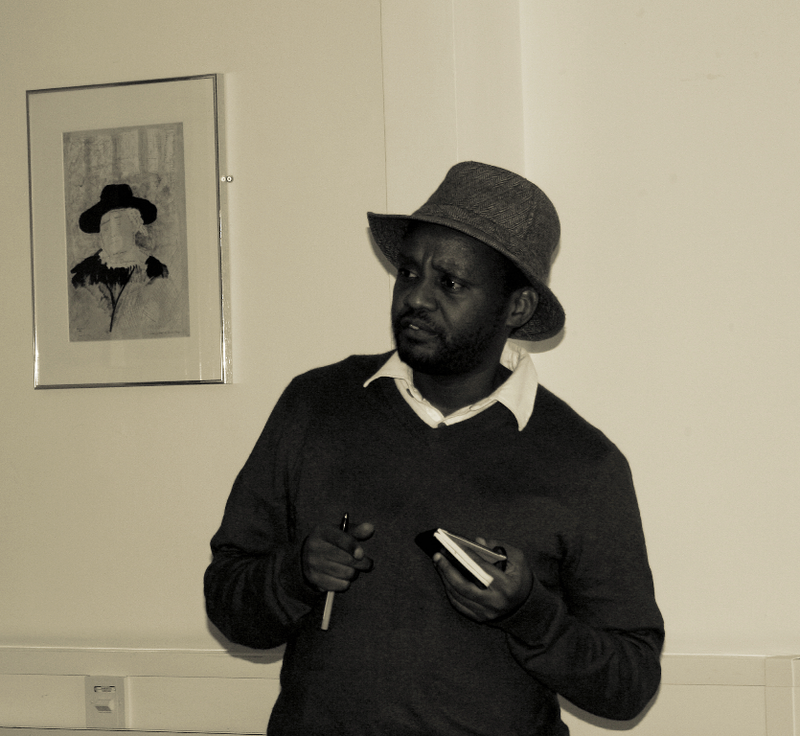 At the end of March we – Katie and Kate – were lucky enough to be involved in organizing the third African Popular Cultures workshop at the University of Sussex. This collaboration between the Sussex Africa Centre PhD committee, tutors from the School of English’s 3rd year Literatures of Africa course and the African Popular Cultures workshop (established by Professor Stephanie Newell), enabled a series of exciting explorations and connections around popular and/or public spaces, and cutting edge research and cultural production today. We felt extremely privileged to host such a distinguished line-up of artists and academics – Professor Karin Barber, Dr Ranka Primorac, Dr Paulo Farias, Billy Kahora and Inua Ellams – and to engage with a broad range of exciting new research from doctoral students in the Sussex Africa Centre through an immersive and interactive exhibition of objects, video, image and text. In many ways the events of the day were brought together by the work of Professor Stephanie Newell, Deputy Director of the Sussex Africa Centre who chaired the exhibition and Karin Barber’s plenary lecture, and spoke as part of a roundtable. It was therefore particularly appropriate that many of the conversations responded to and celebrated the launch of a new collection Stephanie Newell has edited with Ono Okome Popular Culture in Africa: the Episteme of the Everyday (Routledge, 2013) – which in turn marks the 25th anniversary of Karin Barber’s ground-breaking article “Popular Arts in Africa”. Across this week Africa in Words will be publishing a series of articles that document and respond to some of these conversations and the exciting work showcased at the workshop. 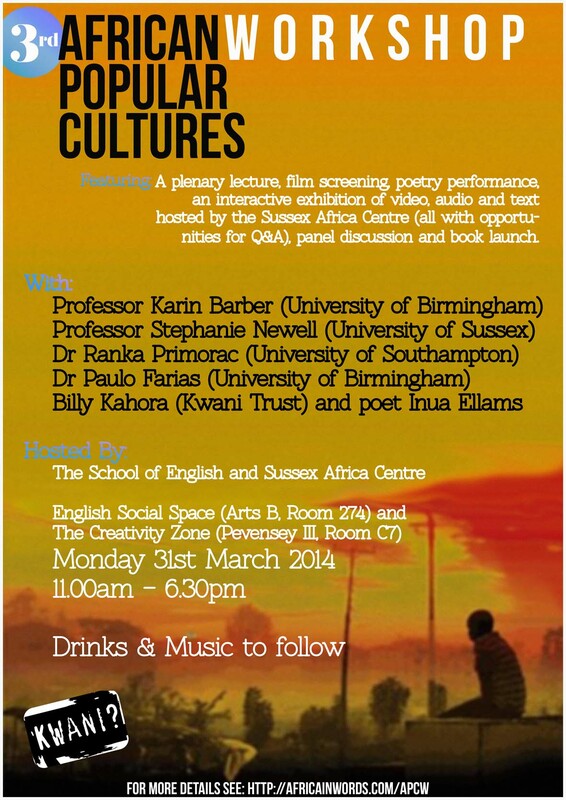 On the 31st March, I was one of the students from the undergraduate Literatures of Africa course at Sussex University who were lucky enough to benefit from a special film screening of Nairobi Half Life, followed by a Q&A with one of its writers, Billy Kahora. It was an interesting set-up in which to see a film for the first time, particularly a film I knew absolutely nothing about. In his introduction, Billy talked about some of the driving forces behind the creative process and what the team of writers he led had tried to achieve in scripting the film. He mentioned the desire to write a script that would be centred on the premise of showing a ‘real’ Nairobi, and the need to create a story that was strong in its plot and characterisation which, he said, was often lacking in Kenyan cinema. Having heard these aims, we couldn’t help but evaluate the film according to Billy’s own criteria; a challenging set of standards which the film proved itself more than capable of meeting. Nairobi Half Life is a local production and has been for the most part praised for its success in raising the standard of quality for Kenyan cinema. The plot itself seems familiar at first. Mwas is a young aspiring actor who leaves the village in an attempt to make it in Nairobi, but finds himself falling in with a dangerous crowd to survive. The rural to urban bildungsroman story is well-trodden ground for an English Literature undergraduate, but Nairobi Half Life somehow managed to feel far from familiar. The plot has plenty of twists to keep an audience interested and enough depth of characterisation to make its protagonists intensely engaging. Standout performances came from Joseph Wairimu as Mwas, and Nancy Wanjiku as Amina, a street-smart prostitute who brings a charm and pathos all of her own to the film. The film’s real appeal, however, comes from a realism that manages to avoid feeling contrived or hackneyed. The use of language is particularly effective here, mixing English, Sheng and Kikuyu, the writers also don’t shy away from using colourful expression. Billy spoke of the aim to make Nairobi Half Life a film that tells Nairobi as it is, without attempting to represent the city in its entirety. It’s a difficult line to tread, particularly in a context where the quest for so-called ‘authenticity’ in storytelling has become so problematic. The depiction of crime is uncompromising and difficult to watch at times, as are many other elements of life in the Nairobi slums (including the most disgusting sequence in a mass toilet I’ve ever seen.) So, the writers pull no punches, but they manage to avoid hammering the audience with the sheer desperation of it all. Mwas leads a double life that takes him from criminal to actor and back again, both spheres existing side by side. As his artistic growth progresses, so does his entanglement with increasingly dangerous crime. The audience are shown two sides of Nairobi, and how its citizens are capable of occupying multiple cultural spaces simultaneously. It’s clearly a confusing state of being, but highly thought provoking. In leading his double life, Mwas moves not only between spaces, but between languages. English is the language of the theatre and of performance. Sheng is the language of the city’s underbelly, in which the personal and business transactions most significant to the characters are conducted. For Mwas, English is the language in which he has to pursue his own creative development. Yet, for the film’s viewers, it is the use of Sheng in combination with English that is the most significant creative exercise. In the Q&A, Billy mentioned the idea of Nairobi schizophrenia, and his interest in the idea that it was a city that required a degree of madness in order to survive in it. Nairobi Half Life depicts a city that is chaotic and frightening but nevertheless very engrossing and Mwas’ navigation of its streets is a journey of surprising profundity, which deserves a very wide audience. 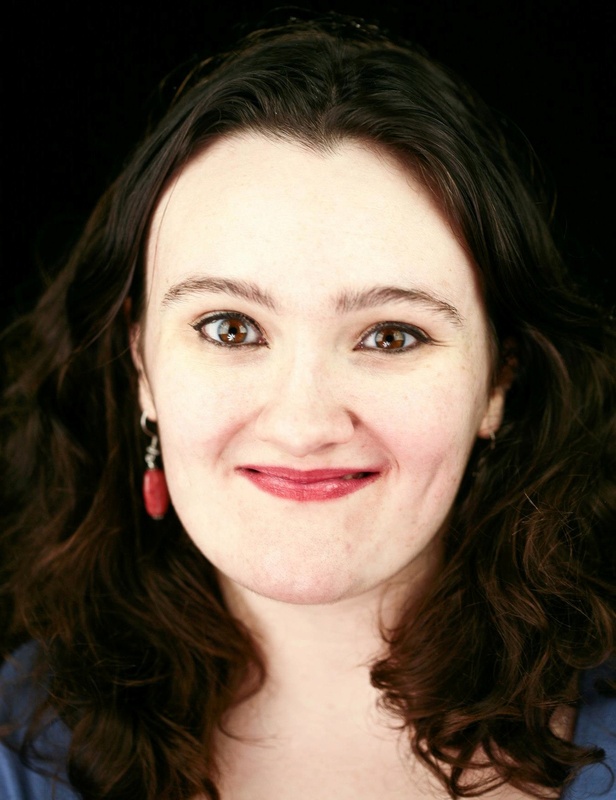 Eleanor McConnell is an English and History undergraduate in her final year at the University of Sussex. This term she has taken the third year dissertation module ‘Literatures of Africa’. She is looking forward to starting a Masters in Human Rights Law at the School of Oriental and African Studies next year. Thank you to Grace Pavey for permission to use her photos from the event.